In every business, where products or services are supplied into the organization, there is a critical need for an effective and efficient supplier quality planning program. The success of a business is directly impacted by the ability of suppliers to consistently deliver to required specifications (specifications include quality, reliability, time and cost expectations). Failure by a supplier, will directly impact the receiving business. Depending on the criticality of the materials and services supplied, failure by a supplier to deliver to the needs of the purchasing business can result in production shut-downs, product recalls, customer injury, liability claims, etc., etc.. Therefore, supplier quality planning, must be a key component of daily operational planning and longer term strategic business management planning. There are a number of steps which need to be effectively implemented when planning Supplier Quality. The first step in any supplier planning program is to determine what business activities will be outsourced to suppliers. An organization will need to have a clear picture of where core and non-core competencies are at present within the business and what will be the organization’s core competencies in the future. These are critical decisions. The organization needs to be absolutely clear with respect to where it sees core competencies in the future. Once known, then non-core activities are open for outsourcing, core activities need to be strengthened. In this latter case, where suppliers are involved in providing core activities to a business, the involvement of material or service providers, needs to be on the basis of helping the organization to build up capability around planned future competencies. Following on from the above, the organization will need to a have a clear picture of the current situation in terms of in-house capacity, volumes, technology, flexibility, etc.. This knowledge can then be considered versus planned demands on the organization, in order to develop the “needs gap”, i.e. where do we need suppliers to fill the gap in terms of product or service provision. This “needs gap” will then be either filled internally or via suppliers. The organization will need to decide, taking account of the strategic approach for the organization and the view of the business in terms of core and non-core activities. Quality Assurance. Quality Management Systems. Quality Assurance, Quality Management Systems. Use to develop your personal knowledge and understanding. The attitude of the organization to risk, needs to form part of the planning and supplier quality assurance program. Is it better for a business to source locally even if this local sourcing is at a relatively high cost, or seek to source at lower cost where a supplier is distant from a business? Will the length of the supply chain, increase the risk of supply interruptions? Will a local supplier offer the opportunity for greater future integration into the business? Will suppliers be seen as completely independent third party entities, who just provide the required raw materials and services, or will they be seen as an integral part of the organization? In this latter case, at the most integrated, the supplier, may be inputting into the strategic direction of the organization. Here, the success or failure of both entities are directly linked. In the former case, suppliers come and go, based on who can compete based on cost, quality and delivery. Most organizations will have a mix in terms of the level of supplier integration. Define if there are opportunities for ship to stock and ship to line programs. The focus on suppliers, should be to take a long term view. A business should seek to achieve a supplier relationship where incoming inspection is not necessary as there is a confidence in the product or service being provided, that eliminates the need to checking quality levels. The supplier planning process needs to consider the potential for supplier development, beyond the current ability of a supplier to provide materials or services to specification. When it is agreed which materials or services can be obtained from suppliers, then the approach to what assessment, qualification, rating, monitoring, reporting and communication processes needs to be defined. How will they be measured? Who will perform the measurement? What will be the frequency of measurement? Will supplier quality levels be shared will all suppliers, or just to the specific supplier being measured. There will need to be clear corrective and preventative action procedures in place. If a problem arises, how will it be addressed? The speed of correction will be critical for suppliers that directly impact on core competencies. Equally, there needs to be effective preventative action systems in place, to ensure that the business and its supplier learn from any mistakes to ensure non-repeat, plus also to ensure related activities learn from the errors of others. The business needs to ensure all affected stakeholders understand the planned approach to suppliers, are fully supportive and have sufficient competent resources available to support the supplier quality program. Supplier quality team, standard procedures and supplier reporting. Once the approach to suppliers has been determined, there will be a need to ensure that the supplier quality group, are adequately resourced. Many organizations dedicate significant resources into their supplier quality programs, others, see supplier quality as an add-on to the the range of responsibilities for the Quality Assurance group. The correct approach will depend on the risk posed to the business by potential failings associated with suppliers. There will be a need for defined standard operating procedures, outlining all aspects of the supplier quality management processes. All relevant stakeholders should be fully competent in these procedures. 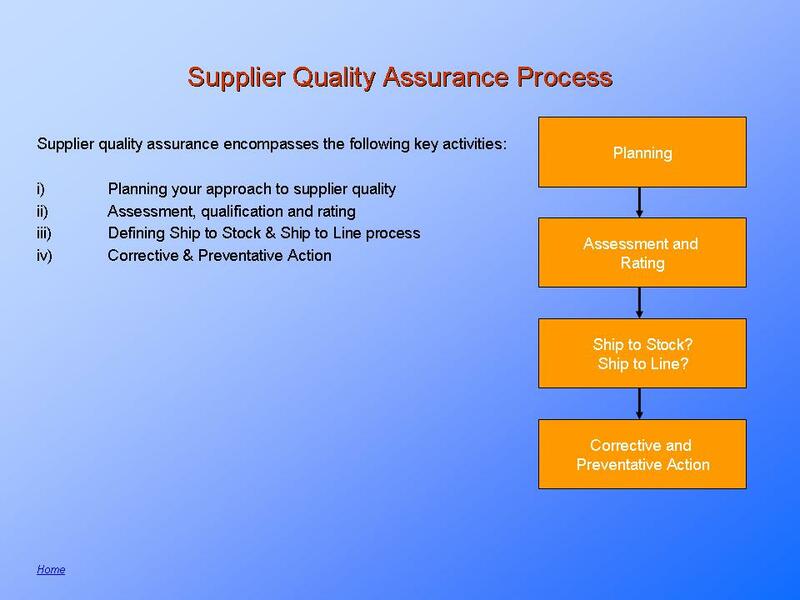 All supplier quality programs will involve supplier auditing. High risk suppliers, will need frequent, intensive audits. For lower risk suppliers it may be suffice to insist on third party certification, for example, having ISO 9001 certification, may suffice in lieu of having to perform an audit by the customer business. The lowest risk suppliers may not need any form of auditing. Non-conformances identified during audit, will result in corrective actions. These corrective actions may be rated as major or minor. It would be common practice, that where a major non-conformance is identified that the supplier would be placed on “hold”, or alternatively some form in increased level of inspection would apply to their products or services until such time as the corrective action is satisfactorily addressed. Where suppliers have very comprehensive quality systems in place, with demonstrated low variability on their product or service outputs, then ship to stock or ship to line programs can be considered. The clear advantage being that there is no need for incoming inspections, and effectively the supplier is feeding directly into the customer business, so that inventory levels can be reduced, cycle times decreased, inspection costs lowered, etc..
As part of the supplier quality program, there will be regular monitoring of supplier performance. This may take the form of a monthly report, detailing quantity supplied, defect rates detected, improvements implemented, audit reports, etc.. The objective of such reports, must be to clearly communicate performance and to encourage improved future supplier performance by focussing supplier management on the key issues of concern.